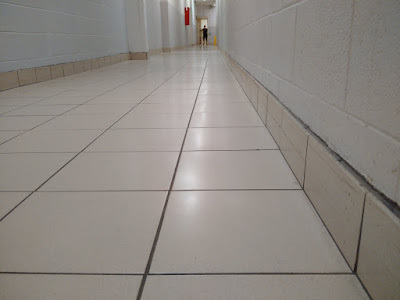 Written Inc.: The most depressing corridor. Ever. I find it hard to believe the architects who came up with this "design" were happy with the result. I just don't see them finishing up their drawings at the end of the day before excitedly high-fiving each other in professional triumph. If their goal was to inspire Eeyore to wander alone into the desert, mission accomplished. This is as far from triumph as it gets, a built-to-a-price compromise made sadder by the fact that it's the norm rather than the exception. We can do better than building structures that look tired before the first coat of paint dries.